The best known spot here is Little Hawaii. This voluminous wave can hold big swells. The waves shapes nice during low tide, watch out for the shallow reef! This solid right is at the northern end of the beach. El Palo (trunk) breaks in front of the dead tree on the beach. A great beach break with breaks to both sides. 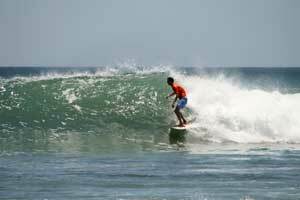 Surf this wave during high tide with a medium swell. 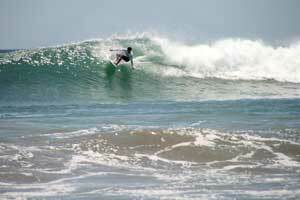 The waves at El Parque, at the parking lot, are very similar to the waves at El Palo. 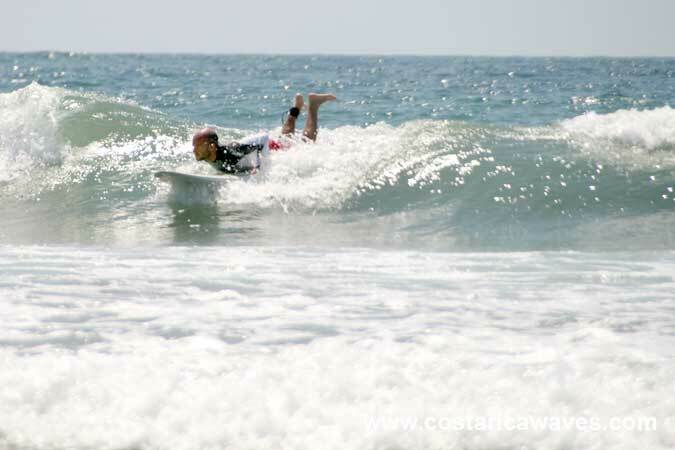 This, left and right breaking, wave is best surfed during high tide. Compared to El Palo the ocean is gentler at this place. El Estero is the spot to surf when the swell is massive and the tide is low. With waves to both sides and barrels to the left this place can get crowded! The wave breaks over a rocky bottom. 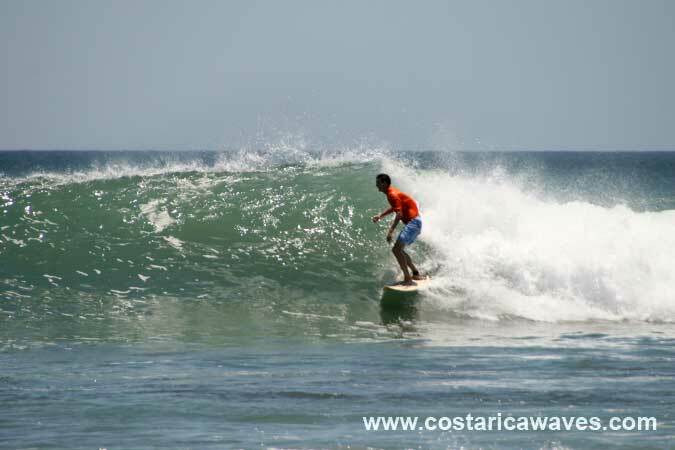 Playa Avellanas can be reached coming from Tamarindo or via Paraiso. During the rainiest month of the rainy season (September, October, and November) a trip to this beach can turn into a mission impossible. Road conditions wary from day to day. downpours can convert rivers into impassable obstacles. 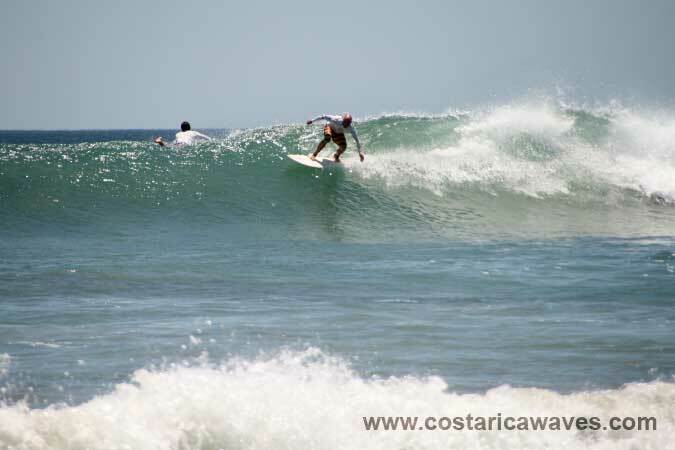 Playa Avellanas is popular amongst surfers from the Tamarindo area. 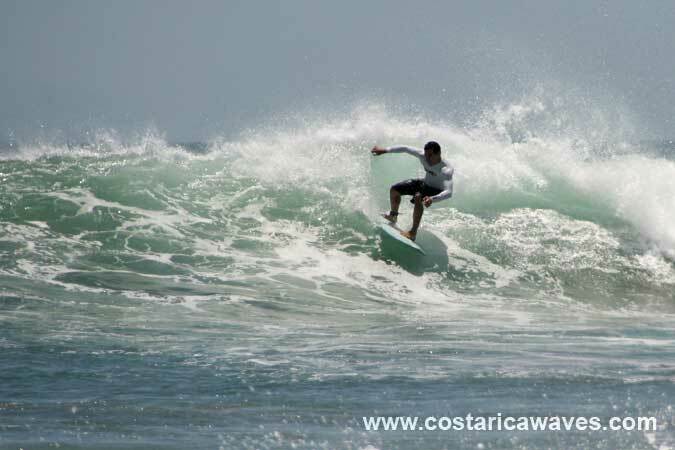 Catching a small wave in Playa Avellanas. 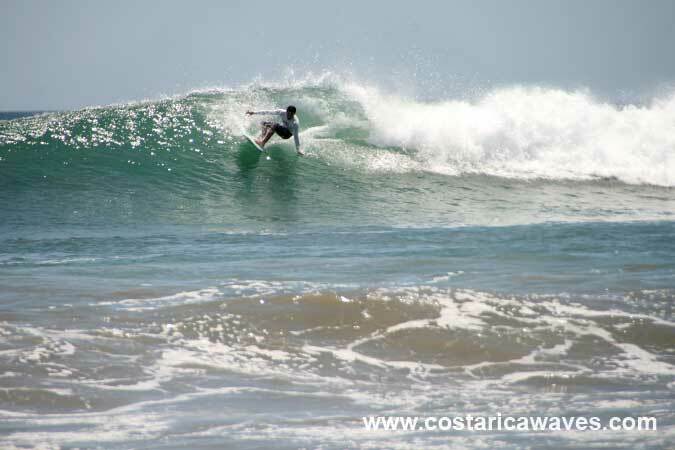 Surfing at Playa Avellanas, Guanacaste. Surfing El Estero in Playa Avellanas. Pay attention to the shallow reef at this spot! The more powerful waves break at the norhtern end of the beach, at Little Hawaii. Charging down the line at Little Hawaii. At Little Hawaii the waves break over a reef. The spot is directly infront of the beach access of Hacienda Piñilla. If El Parque, El Palo and El Estero are too small check out Little Hawaii!